Dave and Julia are determined to not fall victim to high school clichés. The night before the first day of their freshman year they draft a list of all the clichés they must avoid in the years to come. All goes well until March of their senior year when Julia decides that, before the school year ends, they have to complete every item. (Even the one about never dating your best friend.) High school as they know it is turned upside down, and Dave and Julia begin to see the world in a new light. 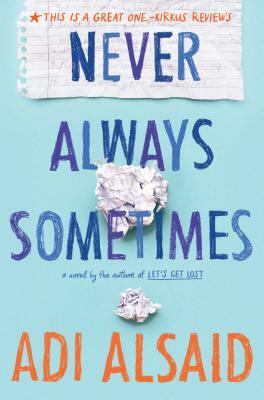 Adi Alsaid’s Never Always Sometimes is a funny and endearing story of friendship and high school told by two people living it to the fullest. Never date your best friend Always be original Sometimes rules are meant to be broken Best friends Dave and Julia were determined to never be clich high school kids--the ones who sit at the same lunch table every day, dissecting the drama from homeroom and plotting their campaigns for prom king and queen. They even wrote their own Never List of everything they vowed they'd never, ever do in high school. Some of the rules have been easy to follow, like #5, never die your hair a color of the rainbow, or #7, never hook up with a teacher. But Dave has a secret: he's broken rule #8, never pine silently after someone for the entirety of high school. It's either that or break rule #10, never date your best friend. Dave has loved Julia for as long as he can remember. Julia is beautiful, wild and impetuous. So when she suggests they do every Never on the list, Dave is happy to play along. He even dyes his hair an unfortunate shade of green. It starts as a joke, but then a funny thing happens: Dave and Julia discover that by skipping the clich's, they've actually been missing out on high school. And maybe even on love.